Sign up now and I'll keep you posted on the site's progress or go to http://www.jorj.com/ for all current information. One of my favorite Nana activities is walking. The grandkids love to go outdoors, and so do I. They ride bikes and trikes. I’m either running to catch up or waiting to halt their down-hill coast. We stop to gather leaves, throw around a few acorns and pet the neighborhood pups. Just being with them, listening to their sibling chatter, is reason enough to take the stroll. Taking a walk, on a stunningly clear afternoon is not only a memorable experience, but an educational one as well. 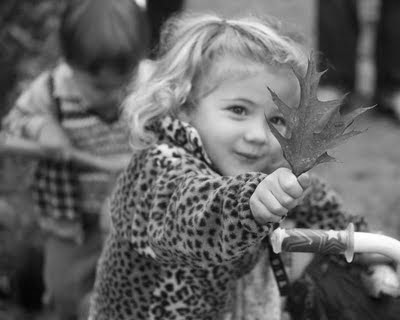 Tying shoes and zipping jackets before we leave the house, counting the leaves that we collect, throwing with the right or the left hand, even tracing the airplane as it flies overhead, all are teaching moments. As Nanas, we are both teachers and keepers of family traditions. I hope that over the holidays, you will have the opportunity to take a simple walk with your grandbabies. And when you come back into the house, a warm cup of cocoa and a slice of home baked cake, like my Eggnog Pound Cake with Sweetened Cranberries, will be the tummy topper to a walk-in-the-park afternoon.